This movie churned in my mind and heart for a long while after watching it. If you're going to watch it yourself, stop here to avoid me spoiling my favorite part of the film. Each night, Antonina, the zookeeper's wife, played the piano once the guards were gone for the day around midnight. Her playing was the signal that the coast was clear. The children, women, and men hiding in the basement then started making their way up into the living room to share in the music, and to sit down for a meal together. There's an especially touching scene that I keep replaying in my head. The zookeeper rescues a good friend and brings him to the house secretly. The friend is on the couch the night of his rescue, telling them to bring him back, that it's just too risky for them to hide him. Just then, Antonina begins to play the piano, and people begin filling the room. The man, so moved as he realizes what has been going on, begins to weep. Such beauty and power in this protest of love. As I reflect on the film, I wonder how we can best face the threats to our integrity, our peace, even our human survival in a way that has as much grace and power. What is it that brings the threats into check; what turns the pendulum in the other direction; what brings peace? If Antonina and her husband had chosen to spit on the guards, to resist them, to oppose them at every encounter: they would not have saved a single person. They would just be added to the list of casualties of the war. As it was, by seemingly cooperating with the Nazis, helping them raise food, interacting with them cordially, they were able to save around 300 people. And not only did they save their bodies. The kindness and goodness the zookeeper and his wife showed was a healing balm on the wounds those people suffered from the horrific treatment they had received. The zookeeper and his wife display a quality that seems so rare and important to me, one that's hard for me to fully articulate. Courageous, loving, strategic, kind. The way they move and act in this film feels like an integrated balance of masculine and feminine qualities that bring a great and powerful light to the darkness. I feel inspired thinking of it, wondering how the injustices of poverty, violence, war, mass incarceration might be met by that same rare and beautiful quality. I remember the day when the shooting at Columbine happened well. It was my first year in law school and a girl with red hair whose name I can't remember but whose face I'll always remember came into the library where I was studying with a bunch of other people. She told us there was a high school shooting going on in Colorado. I didn't even fully understand what she was saying there in the library; I'd never heard about anything like that before. It wasn't until I got home in front of my own tv screen that I began to understand and feel the heartbreaking gravity of the situation. Now, almost 19 years later, scenes like the ones from that day in 1999 have become commonplace. A verse could certainly be added for the NRA that consistently blocks gun reform, the politicians that don't support changes in our gun laws that might help keep guns out of the hands of minors or the mentally ill, the makers of automatic weapons, or even the makers of video games that give people the opportunity to experience and even practice these horrific acts. "It was you; it was me; it was every man. We've all got the blood on our hands." As much as we can justifiably point fingers when something horrible happens, that assignment of blame doesn't seem to make anything better. Some will say that the blame helps us by: getting important questions answered so we understand what happened, putting dangerous people into police custody, and causing security measures to be increased in ways that save lives. I can agree that these things may have an impact in some incremental way, and if all the people and things we could blame would change, there might be a significant impact. I just feel that none of those things addresses the heart of the matter in a way that will keep these horrible tragedies from happening and even escalating. As I see it, the blame that we throw around is actually a potent ammunition that we keep pouring into the dynamic that fuels these violent acts. The only thing that will bring real change is: if we can influence the intention that is behind the violence; if the hearts and minds of people who may be feeling similarly isolated and moved to commit horrific acts violence can be reached; if there is an environment of love and openness that allows these people to feel able to reach out for the help and support they need to heal. Blame comes from a view that we are separate actors with easily sectioned off responsibility, and yet, that isn't reality. In fact, we are all connected. Some words we speak to a stranger at the drug store can have a ripple effect that travels through so many people and stretches far and wide. We are each an important part of what happens in our world - both beautiful and tragic. Even if only in quite subtle ways, we all play a role in holding up the environment in which these violent tragedies occur. And when we look at all the insults and anger thrown around in our public dialogue, we can begin to see how the escalating mass violence is actually a reflection of other behaviors that have become commonplace. The way we carry on a discussion with someone we disagree with isn't actually happening in a vacuum. The way we send nasty messages out to tons of followers isn't just some insignificant action of venting anger. These actions we take, often quite thoughtlessly, are all connected to the whole. They are those rippling energies that we're sending out into an already volatile system. They are the ways that many of us have the blood on our hands for terrible things that happen in the world, even though the full chain of cause and effect cannot be traced. Seeing the blood on our hands need not induce guilt or shame; it can empower us. We can stop believing in this immature and illusory dichotomy that the world is split up into perpetrators and victims. We can embrace the reality that from situation to situation, perspective to perspective, we are all both perpetrators and victims, and so much more. We are also powerful creators. When we are really open to seeing where we feed into the realities that we hope to shift, we can claim our greatest power to create the changes we want to see in our world. On the other side of blame, we might just be able to create the world that days like yesterday make us crave. I wanted to keep it concise and reasonably clear, suitable for the level of attention that I tend to give to Facebook posts, so I elected not to go as deep as I could. Then, a good friend commented to me on precisely the part of what I wrote that didn't feel completely true to me. I decided it was worth revisiting that part in a longer post on here, if only to create a bit more completeness for myself. It's this sentence: "Our society will always include both perpetrators and victims, and both of them are irrevocably connected to the fabric of our society, connected to each of us in the web that includes their families, friends, communities." To me, it expresses only an aspect of the wider Truth. Not only does our society contains both perpetrators and victims, but each of us is both perpetrator and victim. This isn't such a popular view, since it's in conflict with a lot of people's self concept, but to me, it just seems like the undeniable reality. From situation to situation, relationship to relationship, and one period of time in our life to the next, these lines are constantly shifting in all the conflicts of our lives. We all lash out or withhold in a great variety of ways. We can feel that it's the pressures of a work environment, rushing to get somewhere, systemic limitations, or a harm that's been done to us that caused whatever actions or inactions led us to take on a perpetrator role, but still, it happens. The truth of how we're all not so different really hit me back when I was a public defender. I used to write sentencing letters to a judge prior to one of our client's being sentenced, and I would have our clients tell me their life story so I could sift through for useful tidbits that would help me humanize this client in front the judge deciding his or her fate. Without fail, I was always deeply moved by the hardships these people endured, by the circumstances they faced that I couldn't imagine having to face. And several times, I was faced with the realization that I probably would have committed the crime they had committed if I had lived their life. If I had the same hardships, the same lack of emotional and financial support, the same pressure on my shoulders, and the same lack of opportunity, my ambitious, get-it-done attitude would've likely found that same pathway appealing to reach my goals and solve my problems. The real difference between me as the lawyer and them as a criminal defendant had more to do with the very different circumstances of our lives, things completely beyond our control. There wasn't an intrinsic difference in who we were as people. We were both just doing our best, within the life we were given. And from those reflections and looking at my own experiences, I've come to feel that the lines between perpetrator and victim aren't solid; they are fluid lines, constantly moving both within us and within our society. I've come to believe that to heal abusive and oppressive patterns showing up in our society, the most useful frontier on which to work is the one within ourselves. As we find compassion for the perpetrator within and bring that compassion to the people who perpetrate in our world, we can stop manifesting a world that reflects the illusion that we're so separate, that we're so different, that there are two factions of good and evil that need to keep fighting. Instead, we can build bridges of understanding and feed our energy into a world that reflects our unified nature, a more peaceful world. Today is the International Day of Peace, and I'm psyched! This is a day I actually look forward to each year. When it rolls around and I start seeing posts and reminders that it's coming, it makes me remember why I started writing about peace and why I started this blog. And in all that remembering, I feel more connected to what makes me feel most alive. And if you know me, no surprises about what that is. It's the hope, the prayer, the vision that human beings could create a peaceful world. And not some dreamy Kumbaya kind of fantasy world without any conflict. Who'd even want that? Conflict is where we challenge each other, grow, and evolve; it's the needed drama of life that holds our interest in this wild journey and gives us opportunities to expand. My hope is of a world where the core concepts of opposition and elimination of a perceived enemy are seen for what they are: fearful responses based on a false perception of reality. There is just one interconnected web of relations here. The attempts to banish those people and things we deem evil are futile because even if we try to cut them out, we're still all connected. Throw people in prison: they are still connected, still having an impact on the web, and in the awful conditions that they are enduring in this time of mass incarceration, you better believe they're not in a state to make the best impact they could possibly make on the web of relations. What would happen if we really realized this? Might our prisons look more like healing centers? Might we be more interested in engaging and healing antisocial behaviors, rather than harshly punishing and disconnecting? Haven't you noticed: for all the wars we declare against all these bad things, we don't actually get safer streets, less terrorism, less drugs. We often get MORE of those very things we're fighting against. Opposition is actually feeding the thing we oppose. I really believe in humanity, though. We'll get this lesson that keeps playing out in front of us, soon enough. 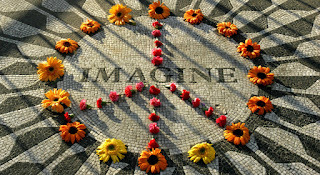 Please celebrate Peace Day today and feed your own creative juice into this dream that we are creating a world of peace. I'm headed to the Peace March happening in DC this weekend: peacemarch.com. Ken Nwadike, the guy behind the Free Hugs Project is the host of the March. I freakin love this guy! If you aren't familiar with him, check him out here: freehugsproject.com. I'm really hoping for a hug on Saturday! And the one super easy thing you can do is give one little minute to peace today. From noon to 12:01, observe the Minute of Silence. The idea is that it will create a “Peace Wave” around the world as people in each time zone take that minute to just be still and feel the peace that already is here right now. Let's ride this wave into the next chapter of the human experiment. I took a major hiatus from the blog, and I really needed it. Trying to force the weekly post became a drag, and then a fit of recycled old posts, and then a stress - and so, I let it go. But now, I finished my yoga teacher training (yay!) and with the space I was dedicating to that endeavor opening up, I'm ready to move in new directions. Randomly, about a month or so ago, an ad for a Tedx conference near me came across my screen and intrigued me to think of my own idea worth spreading. As I dove into this for a bit, I found that one of the application requirements was a short video explaining your idea. I've actually never recorded myself on my phone camera, but the prodding in the little advertisement was convincing, and I happened to be all alone at home at the time, so I thought: "what the hell! Let's if this little idea floating around in my mind has any coherence and clarity at all." You can judge for yourself. I never did apply to do that Ted Talk. But maybe someday. 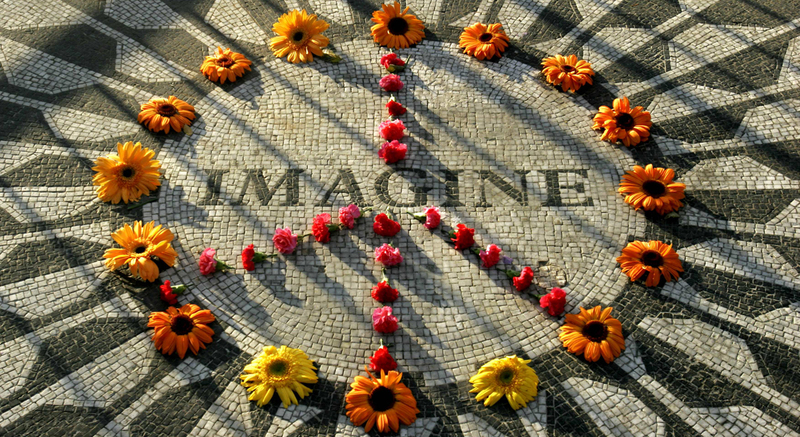 What is a culture of peace and non-violence? The answer occurring to me at the moment: It's a culture based on the truth of We Are One. That little phrase is thrown around quite a bit in religious ceremonies, spiritual circles, and new age discussions, but as I see it, there is far more power in these three words than is often recognized and put into practice. When people act from We Are One, there is a completely different response to a tragic event in the community. Instead of blaming those most directly responsible, there is a collective responsibility that swoops in to help, to restore, and to reestablish balance. There is engagement, instead of anger and disengagement. Instead of "us versus them" patterns, there is an opening question of how will WE heal? We Are One means that we don't get to separate out the bad guys and the good guys. We don't get to make the depleted ozone layer the fault of big business, the gun violence the fault of drug dealers, or violence against women the fault of chauvinist men. Of course there is responsibility by specific parties, but the narrow focus born of our finger pointing misses the big picture. But that finger pointing habit is a really hard one to break. In the moment, it can feel so much easier to find some bad people to blame for something that upsets us. We can buy into the fantasy that if we just get rid of them or make them stop, then the problem will go away. But after so many turns of this cycle, we need to ask if this is really true. Do the problems go away for all the fighting we do? In my observation, the answer to this one is no. The problems seem to just get bigger; they may shift in form and location, but they remain. Just like how viruses get immune to antibiotics, the patterns of violence get immune to the barriers and weapons we use to defeat them. The entire idea of fighting against violence causes us to feed our own energy into the problems we seek to change. To truly transform our violent culture, a culture of peace needs to grow from the seed of peaceful intention. I actually love the phrase "a culture of peace." When we shift from a focus on this intangible concept of peace to a focus on shifting the culture, the norms, and the ways of being, to me, it becomes a more practical movement. We make up the culture, and by looking at the level of culture, more tangible things we can work on within ourselves arise, things that can spill over into actions in our lives, contributions in our immediate communities, and a growing movement within the greater human community. A culture of peace needs to start with our own response to the realities that alarm us, challenge us, and break our hearts. We are all in this together, we are one community, one human race. When we take collective responsibility for the problems in our community, we have a collective power to transform. This march feels like such a beautiful way the people of the city and surrounding areas are taking that collective responsibility and igniting their power for positive change. To me, this field is the culture of peace. When we start spending more time in this field, acting more from our oneness than from our separateness, then I truly believe we will see the dawning of a culture of peace. Written in 2010, and sadly, way more relevant today than it was then. One night at dinner, my 7 year old daughter was telling us the rules of her classroom, and my husband and I sat with attention as she told us, "we're not allowed to say all the bad words. You know, like the 's' word." "The 's' word?" my husband asked almost afraid to hear the answer. She leaned in and whispered, "stupid." After recovering from what I thought was going to be a moment of shattering innocence, I thought about the ‘s’ word and why it was ban in her classroom. This ‘s’ word is one of the worst! Way worse in intent and impact then the meaningless profanities I was so afraid she was beginning to learn. Adults could take a cue from my daughter’s teacher in the rules we follow in everyday conversation. The news and the political conversations that grow out of the news throw around the ‘s’ word or one of its close cousins on a daily basis. We shamelessly belittle public figures and those who follow them, if they are on the other side of whatever we’re talking about. The 's' word takes us smack in the middle of the "us against them" mentality. We build these imaginary fences that divide us into different groups: those that know what’s going on and those that are stupid and misled. These fences grow higher and higher, and those that feel cut out of a conversation form more passionate conversations among themselves. And these divides breed ignorance. This attitude of “us and them” is so prevalent in American politics, and it isolates viewpoints by silencing critical debate that could help us see all aspects of a problem. Debates can go on without antagonizing those with different beliefs and values. Through the health care issue, we see how this “us and them” mentality is destroying our ability to problem solve as a community, and as ever greater problems come up for resolution, this lack of peaceful communication could have much greater consequences than ever before. As I see it, we are seeing more and more of a disturbing mob rule sort-of environment. The group someone stands with seems to have a lot more to do with their stance on an issue than that individual's discernment and attempt to understand the different sides of an issue. I fear that this has us heading down a slippery slope towards a dangerously divided country. A big thing that I think we can all do to build a more peaceful dialogue and world is so simple: if only we can just really follow that rule of my daughter’s elementary school classroom about not using the "s" word. If we refrained from this in our speech and spirit, I truly believe it would make a world of difference. Recycling a post from a couple years back today. Peaceful action, in my opinion, has little to do with how forceful or how tranquil the action itself is. Rather, the relevant inquiry is to examine the perspective from which the action arises. Even an action of great force can come from a equanimity of mind. When there is a true embrace of our shared humanity, I believe that even quite fierce or outwardly violent actions have the potential to move us toward peace. Internal state is where peace starts, and I believe that it's only through actions arising from an internal state of peace that we can bring the peace we have cultivated inside ourselves to the world around us. On a wide scale, I believe humans have fallen into quite a different pattern. Our actions, large and small, aggressive and docile, are much more often fueled by a state of blameful separation and anger. The problem is that whether these actions succeed or fail in the short run, when we step back, we can start to notice that actions to taken with this blameful intention are in vain. The beast we think we are fighting just keeps getting stronger; it just keeps reappearing and morphing into more ruthless forms. When Gandhi said “an eye for an eye makes the whole world blind,” I don't see this as just a line of idealistic poetry. He was stating an observation about how certain kinds of actions work in the world. When we act in the hope for vengeance, in a belief that elimination and punishment will heal our wounds and make us safe, we become blind. I notice a strong resistance to understand what offends us, and I think it is because we’re afraid that understanding would be like condoning or empowering what we think is wrong. So instead, we quite often choose to hate that which offends us. We choose the course of doing whatever it takes to eliminate, block, or oppose that which offends us. And in this course of action, we miss seeing an obvious pattern at work. I believe that the opposite of our conditioned instincts is true. It is our resistance to understand, and the resulting hatred and loss of integrity that IS condoning and empowering the behavior that offends us. We're sending a clear message about what we think of as an empowered voice of opposition, and it actually invites the other side to continue speaking to us in the same language. Entertain the possibility that this isn’t merely a lofty metaphor, but a statement of actual truth. Gandhi’s movement to free India shows how this principle can actually work to break the chain of violence and injustice. Gandhi was so unique in his approach to opposition. He never lost faith in the British; he firmly held that if they really knew what they were doing and saw it clearly, they would leave India. And as we all learned, he was right, and in my humble opinion, this faith in his enemy was one of the most unique and powerful waves of change the world has ever seen. I started this blog because of my hope and belief in a peaceful human race. This passion is such a core part of what drives me and feels important, and I use this blog as a place to explore themes of cultivating greater peace in myself, as well as bringing more of it into the world.